UDM Downloads > Daniusoft Video Converter! Daniusoft Video Converter is a best video file Converter to convert videos among different Video Audio HD Video formats. This video conversion software can convert videos among MPEG/WMV/AVI and other popular video formats such as MP4, FLV, 3GP, ASF, MOV, M4V, MPG, VOB, Xvid MKV M2TS to each other with high speed and excellent quality. Besides, it is easy to use, within only three steps you will get what you want. In addition, this video file converter can also extract audio from video file and convert them to M4A, MP3, AC3, AAC, WMA, WAV, OGG, Flac and APE as you want.By taking advantage of this video format converter, you can enjoy your favorite videos and music freely on any portable player like iPhone, iPod, Apple TV, Zune, PSP, Pocket PC, PDA, PS3, Archos, iRiver, Creative Zen, Xbox 360, PMP, Smart Phone, Mobile Phone, etc.just free download it to have a try! Key features 1. Convert video to MPEG/WMV/AVI and other popular formats as MP4, FLV, 3GP, ASF, MOV, M4V, MPG, VOB, XviD, MKV, M2TS, TS, TRP, AVCHD; 2. Convert Video to Audio - Convert video to audio formats as MP3, WAV, WMA, AAC, AC3, OGG, APE, MKA, FLAC, etc; 3. Portable Players Supported - iPhone, iPod, Zune, PSP, Apple TV, Creative Zen, Pocket PC, Walkman, Mobile Phone, Blackberry, Gphone, etc; 4. 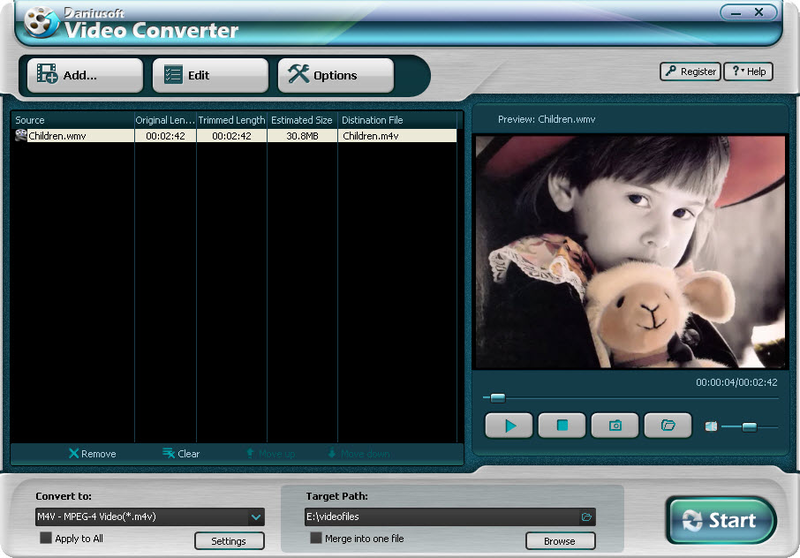 Support Batch Convert Videos and merge several titles into one file; 5. Crop Video - Crop off the black edges of Video, Set the Screen by Keep original/ Full screen/ 16:9/ 4:3; 6. Trim Video - Trim video freely by setting the start time and end time; Set segment length flexibly by just inputting duration time; 7. Customize Video Effect Adjustable Brightness, Contrast, Saturation, and Volume setting for ideal picture quality. Multiple special effects as Gray, Emboss, Negative, and Old Film to enrich your choice8. 8. Capture Screen Shot - Capture your favorite pictures from the video file anywhere & anytime; Save them to your PC simultaneously; 9. Easy to use.